If you've paid even the slightest bit of notice to the Boatrocker story over the years, you'll be aware they've developed a close working relationship with Melbourne's Starward Whisky. Foremost among their joint efforts is the annual release of the barrel aged imperial stout Ramjet, but they've done more besides including, back in 2015, a single barrel's worth of a beer they called Sternweisse, a "double barrel aged Brett Berliner Weisse". While that tiny run won't have registered with most people, it was enjoyed enough by those involved in making it that it's back in greater volume, initially aged in used French oak barrels for six months then racked into freshly emptied Starward casks before conditioning in bottles for a further two months. The label describes it as a "sour whisky treat" but we reckon it shares plenty in common with an oaked chardonnay too. 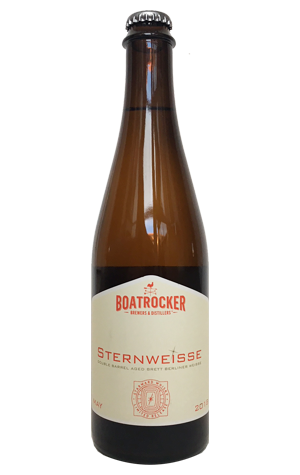 As with many of Boatrocker's barrel aged beers, you could spend an age dissecting what's within this hazy pale golden liquid with a dense and lasting white head: the rich young whisky aromas; the flashes of lemon sherbet and lashings of soft oak; the gentle boozy prickle; the intense sweet acidity that goes to work on the side of your palate. Or you could just try to imagine something that combines elements of chardonnay with a gently soured whisky cocktail. Alternatively, you could just go with the message we flicked to Boatrocker founder Matt Houghton while sampling a bottle: "This is quite something..."
It's a sentiment with which he appears to agree. "I’d love to get 1,000 empty whisky barrels off Starward... Sternweisse nationwide..."